akamura Shigeru (1891-1969) was an Okinawan Budōka active in Karate and Kobudō. He established the name “Okinawa Kenpō” according to his perspective that originally there were no styles on Okinawa. Nakamura Shigeru. From: OKKJ 2008. Shigeru was born the eldest son of father Nakamura Kōkichi and mother Kame in Nago Magiri, the present Kunigami-gun Nago-chō, Okinawa Prefecture. Shigeru grew up listening to the hero stories told by his grandfather and relatives since childhood and became interested in the martial arts. Due to the premature death of his father, he received initiation into tī and ryūkyū kobudō by his father’s younger brother (Shigeru‘s uncle), Nakamura Tei’ichi. Afterwards, at the age of 15, he enrolled in the Okinawa Prefectural Middle School (Okinawa Kenritsu Chūgakkō, the present Okinawa Kenritsu Shuri Kōtō-gakkō or Shuri High School), where he began to learn Karate in earnest. Since in those days the Karate instructor at the Middle School was Hanashiro Chōmo, it seems that Nakamura had studied under him. Shigeru later graduated from the Prefectural Teachers’ Training College in Shuri (Okinawa Kenritsu Shihan-gakkō). Afterwards he held the office of a licensed elementary school teacher at Nago elementary school. Then he went to Tōkyō, where he graduated from the special degree program of the University of Agriculture. Following graduation, he initially held a teaching profession in Nagano Prefecture, but eventually received an invitation by the Kunigami district school for supplementary (private) lessons in Industry (Kunigami Jitsukyō Hoshō Gakkō). In this way, and crowned with scholarly honors, he returned to his home town. After having relocated to Nago, he studied under Kuniyoshi Shinkichi (1848-1926). Kuniyoshi was known as “Bushi Kunishi” (warrior Kuniyoshi), a man with the greatest physical strength of the day who also excelled in horsemanship. Kuniyoshi was a descendant of the Sa-clan, house Kuniyoshi. He lived in Naha Kumoji, which is why he was also called “Yanbaru Kunishi from Kumoji”. Being of the same age as Naha-te founder Higaonna Kanryō, they were the two masters in the East and West of Naha. They acknowledged each other with respect and as partners and rivals in the pursuit of being warriors. Around 60 years of age (i.e. around 1908), Kuniyoshi moved from Naha Kumoji way northward to Nago. There, Nakamura Shigeru studied under him. From Kuniyoshi he learned Kata such as Nīsēshi, a Kata considered to have been handed down by Arakaki Seishō (1840-1918). Few people are said to have become successors to Kuniyoshi Shinkichi, among which was Nakamura Shigeru, the lineage of whom came to be called Okinawa Kenpō. In the postwar era, Tamotsu Isamu (1919-2000) invitated Nakamura Shigeru, Nakazato Jōen of Shōrinji-ryū and Shimabukuro Zenryō of Shōrin-ryū to participate in a Karate Tournament held in Fukuoka Prefecture. Tamotsu Isamu was born in Naze village in Amami Ōshima, Kagoshima prefecture. He was a graduate of the “Taiwan Government-general Office Prison Police Officer Training School” during the time when Taiwan was under Japanese control (1895-1945). He established the Shōrinji-ryū Renshinkan already in 1955. In April 2000 he was awarded the “4th Class Order of the Sacred Treasure”. In June 1961, the Okinawa Kobudō Kyōkai was formed, with president Higa Seitoku of Motobu-ryū, Nakamura Shigeru, Shimabukuro Tatsuo (Isshin-ryū), Uehara Seikichi (Motobu-ryū), Soken Hōhan (Shōrin-ryū), Kaneshima Shinsuke (Tōzan-ryū), Shimabukuro Zenryō (Shōrin-ryū) and others. At the 1st Kobudō Tournament held the same year, Shigeru demonstrated the Kata Nīsēshi. During his lifetime, Nakamura Shigeru cultivated tī and kobudō. He also considered tī from an educational point of view, meaning that he emphasized a personal guidance of pupils. From the idea that originally there were no schools in the tī of Okinawa, he identified himself with the idea of an “Okinawa Kenpō”. It is based on the equation of “Okinawa Tī = Okinawa Kenpō”, he planned a united front for the Karate circles. Nowadays the term Okinawa Kenpō is recognized as the name of his school. His Karate view placed emphasis on the “true strength” of combat power, particularly it focused on the power of the fist. In order to safely use such combat power, he advocated kumite with armor (bōgu-zuki kumite). In shiai (matches) he emphasized that a “knock down system” should be adopted. 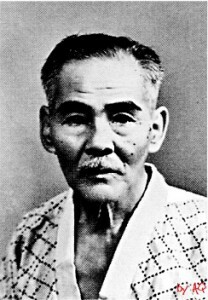 Nakamura Shigeru was the first person who began bōgu kumite in post-war Okinawa. With his philosophy of “tījikun dī’ichi” (the No. 1 fist), he was also a representant of real combat karate. During a business trip to an education exhibition at the Nakijin elementary school he fell ill with an incurable disease of which he died at the age of 78, in 1969. The Kata of Okinawa Kenpō are Naihanchi, Pinan, Sēsan, Passai, Nīsēshi, and Kūsankū. During his lifetime, Nakamura Shigeru had been awarded the title of 10. dan hanshi by the Japan Karate Federation. This entry was posted in Book Reviews, Unknown Ryukyu and tagged Arakaki Seisho, bogu-zuki kumite, Bushi Kunishi, Higa Seitoku, Kaneshima Shinsuke, Kuniyoshi Shinkichi, Kusanku, Naihanchi, Nakamura Kokichi, Nakamura Shigeru, Nakazato Joen, Niseshi, Okinawa Kenpo, Passai, Pinan, Sesan, Shimabukuro Tatsuo, Shimabukuro Zenryo, Soken Hohan, Tamotsu Isamu, Uehara Seikichi. Bookmark the permalink.